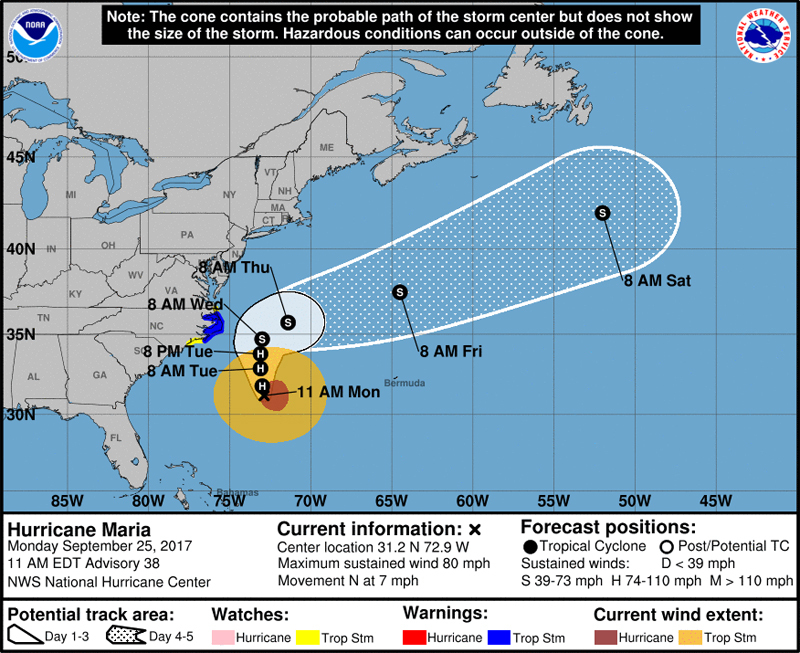 Hurricane Maria continues to be a “potential threat to Bermuda”, the Bermuda Weather Service said today, with its closest point of approach to Bermuda within 72 hrs forecast to be 358 nm to the NW at 12pm Thursday [Sept 28], with the BWS noting that “this system may move closer to Bermuda after this time period. 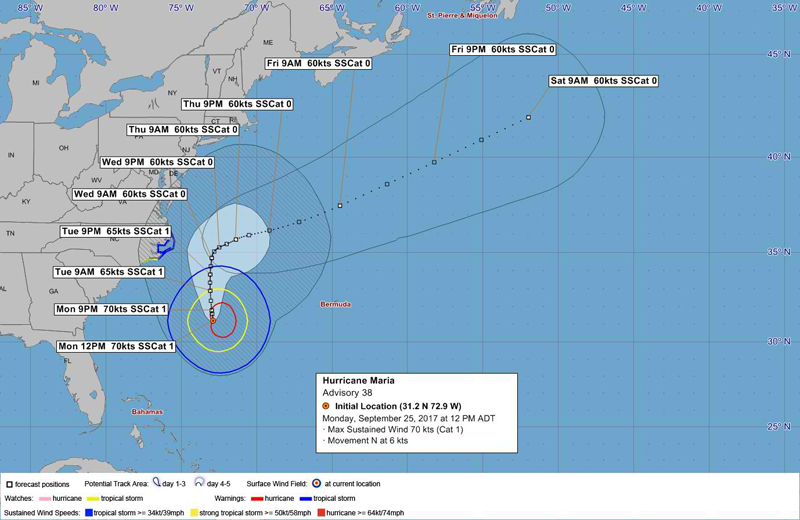 The latest forecast from the U.S. National Hurricane Center said, “Maria is moving toward the north near 7 mph [11 km/h], and this general motion with some decrease in forward speed is expected through Tuesday night. On the forecast track, the center of Maria will move well east of the southeast coast of the United States during the next day or so. “Reports from an Air Force Reserve Hurricane Hunter aircraft indicate that maximum sustained winds are near 80 mph [130 km/h] with higher gusts. Gradual weakening is forecast during the next couple of days and Maria is forecast to become a tropical storm Tuesday night. “Maria is a large hurricane. Hurricane-force winds extend outward up to 90 miles [150 km] primarily to the east of center and tropical-storm-force winds extend outward up to 230 miles [370 km]. I think hurricane plp is a bigger threat. You’ve worn the grooves out, try a new record to play now.. I think hurricane ubp/oba was a disaster.